Hasbro pre-school games are loved in this household. 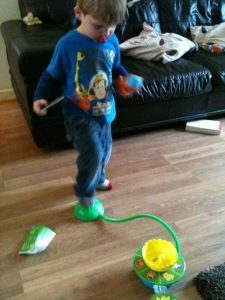 So when we were asked to review Pop Goes Froggio, I was delighted and my boys were over the moon when it arrived. It came straight out the box and was setup. Pop Goes Froggio is a matching game with a difference. You spread out the lily pad cards on the floor and have Froggio and his special lily pad in the middle. The player spins the wheel on Froggio’s lily pad and this chooses picture/character the players have to find. They have to turn each of the lily pad cards over and whoever finds the correct picture wins. When the player makes the match, they run over to Froggio’s lily pad and jump on the pump to make him to flying through the air. Can you catch Froggio or will he fall on the floor? You keep going until all the cards have been matched. This game is for ages 3 and over. 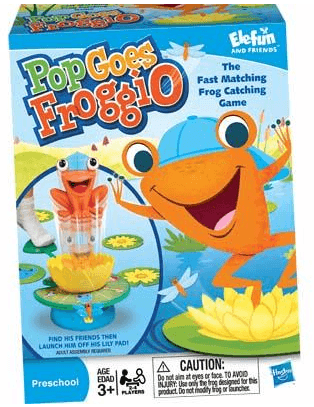 My 4 year old was great at it, my 2 year old loved it as you can see below but he loved making Froggio fly more than the matching. We have so much from with this game as a whole family. It’s really easy to play and any pre-schooler will love it. I would highly recommend it to anyone with a pre-schooler. Great game and great fun. Disclaimer:- I received this product in exchange for an honest review which I have given above.